SC69 means the 69th meeting of the Standing Committee. Standing committees concern themselves with work programmes on an ongoing basis. SC69 attracted 600 delegates compared with the 3500 that attended CoP17 in Johannesburg last year. At CoP17 (2016), the TGA became a founding member of a small, loose but world-wide organisation called “The Sustainable Use Coalition” (SUCO). At SC69, SUCO presented a proposal – which was submitted by “Saint Vincent and the Grenadines” (one of the CITES sovereign state members) – which suggested that the Standing Committee (SC69) should adopt SUCO’s proposed “Code of Responsibility” for NGOs that participate in CITES meetings. The proposal introduced several “NGO responsibilities” for discussion and adoption. The most important one was designed to preclude the future possibility that an NGO could “buy” votes (under any pretext) from the 183 sovereign state members – which has arguably happened at every CoP meeting since (at least) the beginning of the 1980s. In 1987 (CoP/Canada), as a novice to CITES, I myself uncovered two corruption cases in which animal rights NGOs had purchased votes (on a willing seller-willing buyer basis); and at the CoP in Lausanne, Switzerland, in 1989, the same two culprits (from 1987) openly admitted to me that they had again sold their votes to the same NGO. It seemed the vote purchases happened in the same way at the beginning of every CoP, and the two 1987 individuals introduced me to a third sovereign state member who had also sold his vote in 1989. All three of these vote-sellers came from poor Third World countries. This information was acquired by me in a very open and casual manner. Had I conducted a more professional investigation, therefore, I am quite sure I would have revealed many more vote-selling/vote-buying incidents. When (in 1987) I discussed this matter with experienced people – that is, those who attended CITES meetings regularly (including one American lawyer) – I was told: that the whole matter (of vote purchasing) was well known to the US Government Accountability Office (U.S.GAO) – which is the supreme audit institution of the United States Government; that the matter had been investigated by the GAO; and that the GAO investigation had been abandoned because most of the crimes reported to them had been committed in foreign lands, and/or by foreign NGOs, which made these events beyond the authority of the U.S. GAO. The fact that these vote purchases had been investigated by the GAO, however, verifies the observation that vote purchasing is a factual reality at CITES CoP meetings – and that it has been going on for many decades. This fact – ALONE – makes CITES a total farce! It also makes it an irresponsible action for ANY and EVERY sovereign state to enter into such an agreement, today, in the full knowledge that they are surrendering their sovereign rights to manage their own wildlife as they saw fit… to an organisation that is virtually controlled by racketeering NGO rogues. I was told by several people to whom I spoke of these matters, that the states of Africa – legally – had no case to complain about. They had signed the convention documents voluntarily, I was told, so they must now bear the consequences. My argument is that when states (in the 1970s and 1980s) signed the convention papers, the animal rightists NGOs had not, at that stage, “captured” the convention; and the convention itself was not holding the states to ransom. My most compelling argument is that when a sovereign state signed on with CITES they believed they were doing what was best for Africa, its people, and its wildlife. They had no idea that several decades later CITES was to become the Nemesis of Africa. And there is no quick-release mechanism. Any country, today, which of its own accord resigns from CITES faces excommunication from world society; is denied legal wildlife trade with CITES registered countries; and they face, too, the wrath of America by way of a legal instrument called The Pelly Amendment (and the probable application of economic sanctions by the USA as a consequence). At CoP17 in 2016 (Johannesburg), it was revealed that NGOs had “sponsored” the visitation costs of several sovereign state delegations (the numbers were never openly quoted); and when the much-vaunted proposal by Swaziland – that it be allowed to sell its stockpile of rhino horns to build up a fund to fight rhino poaching – was defeated by the consensus vote, about 20 state delegates approached Ted Reilly (Head of the Swaziland delegation). They told him that they had wanted to vote in favour of his proposal but that “their sponsors” had demanded that they vote against it. So, the vote purchases come at a high cost to the sovereign states, and they continue annually in many disguises. Clearly, once a delegation has accepted the bribe, it is then required to vote in the manner that their benefactors prescribe. When the SUCO proposal was made by Saint Vincent and the Grenadines, there was no debate. The Secretary-General (John Scanlon) largely took it upon himself to reject the proposal because, he said, it was not necessary. He virtually claimed that “since nothing was broken it didn’t need fixing.” So, the fact that animal rightist NGOs are known to be buying votes at every CoP meeting was swept under the carpet; and nothing was said about the sponsorship deals that were openly revealed at CoP17. The reason why the TGA was represented at SC69 was that we are a founding member of SUCO and because we felt there was a good chance – if we showed a united front – we could push the “Code of Responsibility” resolution through. We were also conscious of the fact that what we were trying to achieve would have changed the face of CITES (positively) forever. It was, therefore, worth the effort. I, myself, would have preferred for SUCO to have moved (instead of, or in addition to, the Code of Responsibility proposal) for the NGO accreditation rules to be changed – so that animal rightist NGOs would have been denied access to the CoPs. Nevertheless, we were part of SUCO so we attended the meeting in support of our colleagues. I must make mention here that SUCO is headed by Eugene Lapointe (of the IWMC – World Conservation Trust), a former Secretary-General of CITES (1982 – 1990); and within the SUCO group (acting as a major daily advisor) is another ex-Secretary General of CITES – Jacques Berney – who was a member of the CITES Secretariat for 20 years. We were well informed, therefore, regarding what was possible – and what was likely not to be possible – by two very well-informed people. 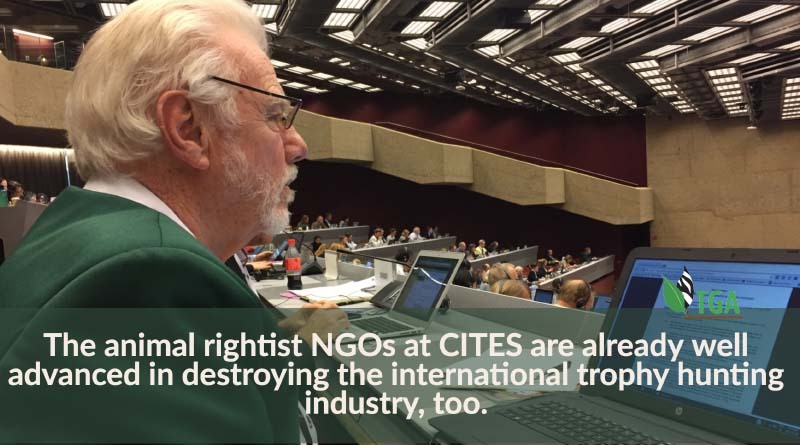 The fact that animal rightist NGOs at CITES are being allowed – seemingly without contest from the Secretariat – to “acquire” (purchase by one means or another) votes from the 183 sovereign state members (The only people to hold a vote at the CoPs) is unconscionable; and it is something that every one of the sovereign state members of CITES should be concerned about. Each member state should be aware that it has totally surrendered its sovereign right to manage its own wildlife resources as it sees fit – to an international convention the workings of which have been captured by a phalanx of self-serving animal rights NGOs who represent what can only be described as one of the biggest confidence industries in the world. These people are South Africa’s wildlife industry enemies. CITES is Africa’s wildlife-business enemy. It is the animal rightist NGOs and CITES’ combined and self-admitted purpose to destroy international wildlife markets that SHOULD be making South Africa’s wildlife industries extremely prosperous – thereby ‘saving’ Africa’s wildlife into posterity. The animal rights NGOs who are accredited to CITES – with the help of CITES – are busy putting the finishing touches on the destruction of wildlife markets everywhere. IF/when they succeed, therefore, they will have emasculated South Africa’s commercial wildlife industry because they will have destroyed the one factor that is necessary to make any business successful – a market for its products. The value of our wildlife industry will then be reduced to what we can make of it domestically. For those of you in the professional hunting industry, who read this blog post, don’t feel complacent. The animal rightist NGOs at CITES are already well advanced in destroying the international trophy hunting industry, too. You are most certainly the next domino; the next in line for demolition. Destroying wildlife markets everywhere will place Africa’s wildlife in jeopardy because the NGOs, through the good offices of their colleagues in CITES, will have rendered our wildlife a valueless commodity. And that will make it impossible to use the inherent value of our wildlife to uplift Africa’s rural communities in any meaningful manner. In an intervention at SC69, I questioned the secretariat’s stated desire to uplift Africa’s rural communities by way of promoting their meaningful interaction with Africa’s wildlife. I asked the Secretary-General, directly, just how he proposed to uplift the status of Africa’s rural communities – and to improve the people’s living circumstances – through integrating their needs with the needs of our wildlife, when he was busy devaluing Africa’s wildlife to zero. He did not even bother to respond! Nevertheless, this reality is a crucial factor in the development of southern Africa’s wildlife industries. If our rural people cannot make a better living from the controlled and sustainable use of our wildlife resource, than they can get from their cattle, sheep and goats – and growing mealies (maize) – they will opt for what they know best: cattle, sheep and goats; and mealies. Our valueless wildlife will then be up against the wall and it will be decimated by the hordes of human beings (4 billion) that will be living in sub-Saharan Africa at the end of this century. There are c.750 million today! For those of you who believe that “next time round the outcomes at CITES will be more favourable for southern Africa”, I must totally shatter your illusion. I am convinced that – without any shadow of a doubt – CITES in its current form will NEVER acquiesce to southern Africa’s requirement for a transparent international trade in elephant ivory and/or rhino horn. The expensive industry that South Africa’s Private Rhino Owners Association (PROA) has set up will never achieve its potentials. PROA cannot flourish without a legal and international market for rhino horn; and it will never be able to stop the scourge of rhino poaching because it is being denied, by CITES, the financial resources to operate properly. The TGA has pledged to create a better-informed public – and this it will continue to do. Its public has now, however, extended its working boundaries to include China, Vietnam, Laos, and Japan – where the TGA will be recommending that the people of the Far East should NOT close down their legal markets for ivory and rhino horn. Instead, they should start to liaise purposefully with the SADC countries of southern Africa to investigate a new deal Wildlife Trade Convention where the interests of wildlife and of people will predominate; and where animal rights activists will be denied. Will such an idea work? I don’t know! But we must try. What I can tell you – with absolute certainty – is that wildlife in Africa is doomed if Africa continues to “go with the CITES flow”. The only things that “go with the flow” are dead fish in tidal currents! I intend, now, to construct a new book on this theme. Writing a book on the subject is the only way I know how… to provide society with the FULL and HONEST picture that I have sketched so briefly above. Stick with us – the TGA. Those who haven’t already done so, please join us. I believe we CAN and WILL make a difference… a HUGE difference. And the TGA is now going to go all out to achieve that goal. Still as mad and deluded as ever, I see. Thompson has been peddling this vote-buying stuff for decades but has never managed to produce a single scrap of evidence. Try making inquiries with the American GAO Government office – mid to late 1980s. They investigated vote buying at CITES 1987 and 1989 – and they discovered that they could do nothing about it because the crimes were committed on foreign soil – and, because of that, they were outside the jurisdiction of American law. Try making inquiries about what happened at CoP17 in Johannesburg last year: when it was revealed that many poor delegations were paid (sponsored) the HEAVY cost of their participation at the conference (airmail costs; hotel costs, and so forth) by animal rightist NGOs. The cost to the sovereign states concerned was that they surrender their votes to their benefactors. You want “the facts” – the “evidence” – it’s freely available… but do your own investigation in future “Michael, my friend”. I am done falling over backwards to satisfy needs of sceptics like yourself. Nevertheless, I am puzzled: Why are you so adamant that what I have reported on the vote-buying is “Fake News”. Have YOU investigated these reports yourself? ; and have YOU discovered that they were false. If not, I would suggest that you direct your strange chagrin elsewhere. Thank you Lorne. Keep in touch with us.